Protect your Samsung Galaxy S9's screen from harm and keep up to date with your notifications through the intuitive LED display with the official black LED cover from Samsung. To be honest, I was only looking for a cover to protect my phone I saw it had a digital display but did not realise what it actually did. Wow.... brilliant technology. And with the App that you get enabling you to customise your contact's displays it personalised your experience. Samsung well ahead here!!! 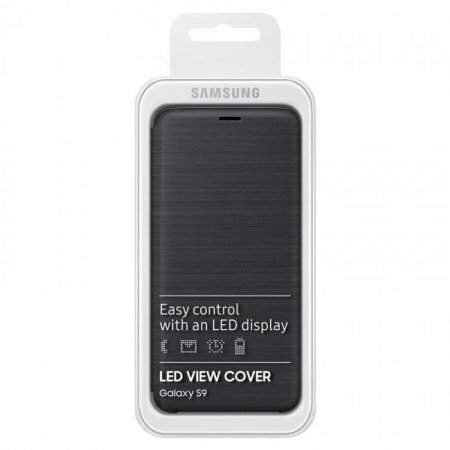 Beautiful and functional, the Official Samsung LED Cover is also brilliant in terms of form. Featuring a stylish dot matrix design that harks to be a simpler time when dot matrix displays appeared on machines, clocks, railway departure indicators etc. This case will fill you with feelings of nostalgia when you view your notifications in this style. The LED display details information on your phone's status including current time, calls, messages, battery status, volume to name just a few - viewed quickly and easily from the front of the cover without the need to open the case to view the S9's screen directly. This is an official Samsung product, so it's made to the highest standards with the best quality materials. 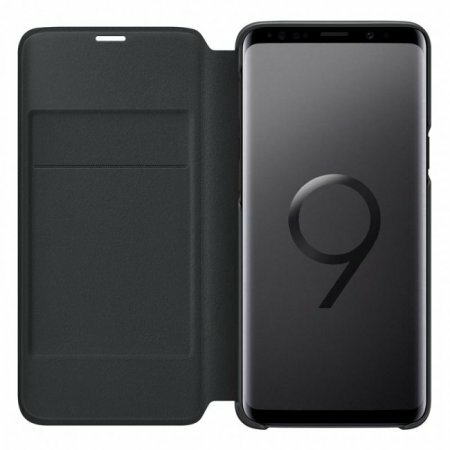 It is designed specifically for use with the Samsung Galaxy S9, so offers a perfect fit and does not impede the use of any of the functions including the power and volume buttons, headphone and charging ports or front and rear cameras. 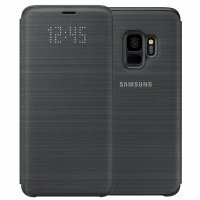 Inside this Galaxy S9 LED cover you'll find an intuitively designed slot for storing a card, your ID or even receipts and train tickets while still maintaining its slim design. This can also be used to store cards that include contactless features, meaning they will never need to be removed from the LED cover. Protect the front of your Samsung Galaxy S9 from scratches, scrapes and front-on impacts with the official flip cover. This cover replaces the back of your device without adding any bulk and then folds over the front when not in use. 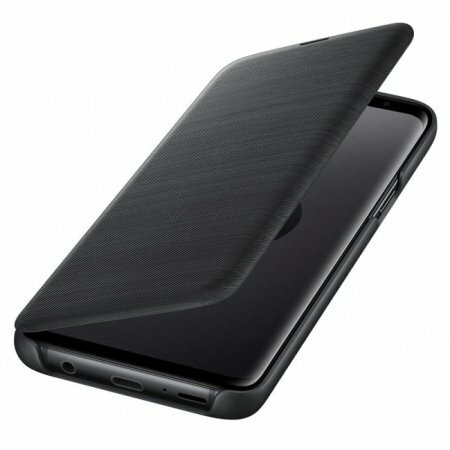 This means that the most important part of the phone, the screen, is protected from harm without the added thickness and weight normally associated with flip cases. 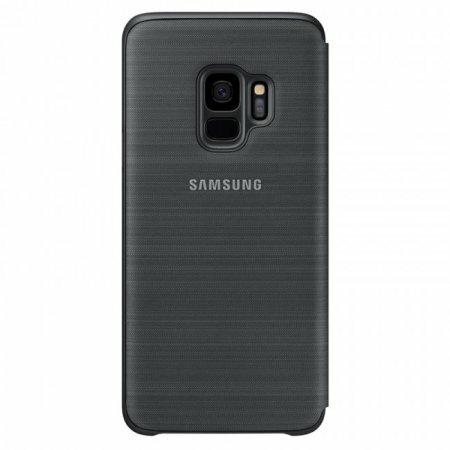 Featuring a special edge coating on the cover provides a premium finish expected with an official Samsung accessory while also benefiting from enhanced grip. 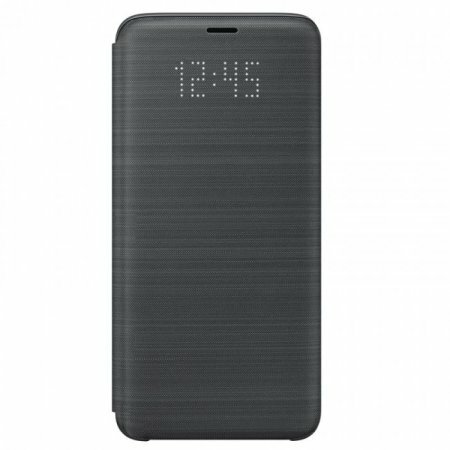 Samsung have created a premium cover that will wake up your phone's display when you open the cover and turn it off again when closed. This preserves your phone's battery power, so you can be sure your Galaxy S9 retains its energy when not in use. Made from high quality synthetic leather materials, this flip cover will keep your Samsung Galaxy S9 screen looking good as new. The cover is tough enough to withstand day-to-day punishment without blemishing, so both your phone and cover will remain pristine for longer.